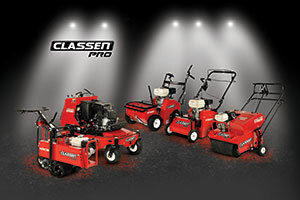 Classen introduced its Classen Pro line of landscaping equipment for commercial landscape contractors. The product line includes five products: a new stand-on aerator, a walk-behind aerator, an overseeder, a sod cutter and a turf rake. The line offers hydrostatic transmissions, anti-vibration grips and power steering. The overseeder, turf rake and sod cutter feature hydrostatic drives. The Classen Pro HSC18 Sod Cutter is the fastest model in transport on the market due to its hydrostatic transmission and powerful engine, the company said. Additionally, this model includes a Honda engine that allows the unit to reach speeds up to 4.7 mph. Classen also incorporated its patented split-drive system into the Pro PowerSteerTM walk-behind aerator. The split-drive allows the engine to power dual tine shafts independently for improved maneuverability during aeration, Classen said. In addition to the hydrostatic drives or power steering, many Classen PRO products feature anti-vibration handles and vibration dampening into the equipment.